Tutankhamun was a Pharaoh of Ancient Egypt. He reigned from when he was nine years old (1334 BC) to when he died (1323 BC). He became Pharaoh of the 18th dynasty (royal family) during the New Kingdom. 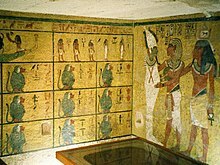 Tutankhamun was the son of [[Akhenatenname="autogenerated640">Hawass, Zahi (2010). "Ancestry and Pathology in King Tutankhamun's Family". Journal of the American Medical Association 303 (7): 640–641. http://jama.jamanetwork.com/article.aspx?articleid=185393. Retrieved 21 October 2013. </ref> or perhaps one of his cousins,Kiya. 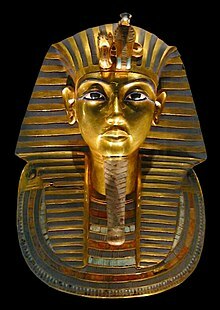 Tutankhamun ruled for 9 years and died very young, at 19, so he is known as The Boy King. He was married to his half-sister Ankhesenamun, daughter of Queen Nefertiti, his step mother. In his third year of his reign, Tutankhamun reversed several changes made during his father's reign. He ended the worship of the god Aten and restored the god Amun to supremacy. The ban on the cult of Amun was lifted and traditional privileges were restored to its priesthood. The capital was moved back to Thebes and the city of Akhetaten abandoned. This is when he changed his name to Tutankhamun, "Living image of Amun", reinforcing the restoration of Amun. In 1922 Howard Carter found Tutankhamun's tomb. Tutankhamen is believed to carry a curse. People who saw the coffin later died. Many believe this but it is not true as the archeologists who have visited his tomb died from natural causes. Recent studies of his body using CT scans and DNA tests show that he had two children, but they died very young. Scientists now believe he died from a broken leg, made more complicated by bone disease and malaria. Before this discovery there were many theories about his early death, including murder. It is quite certain that he was infected by several strains of malaria, and very likely that he had some genetic defects caused by inbreeding. His parents were brother and sister. The final cause of his death is still unclear. In 2014 the Egyptian Museum in Cairo opened four new halls in the Tutankhamun Gallery. ↑ Hasan, Lama (2010). "How King Tut died revealed in new study". ABC World News. ABC. Retrieved December 10, 2012. This page was last changed on 8 March 2019, at 04:42.